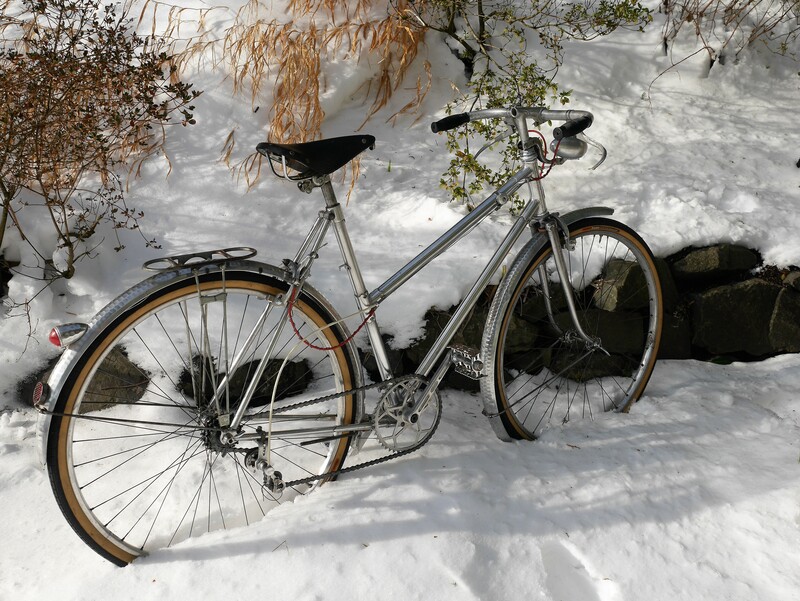 This winter’s crazy weather in Portland, Oregon finally gave me the time and focus needed to complete the restoration of a very interesting bicycle – a late 40’s/early 50’s Mercier Meca Dural. 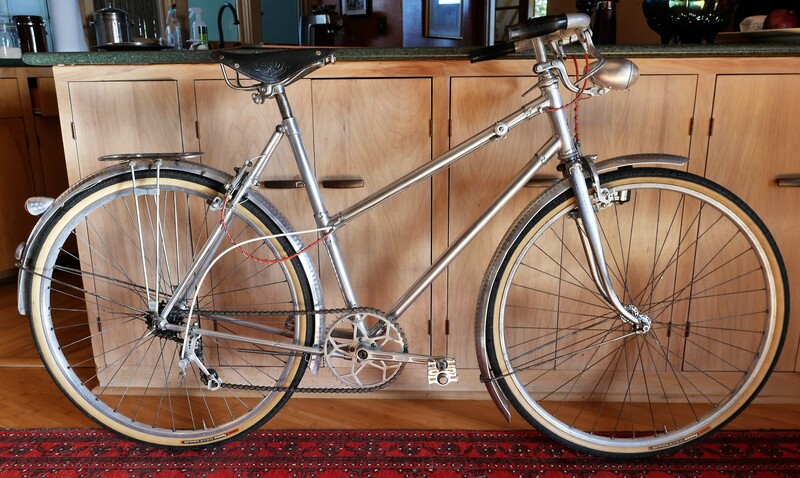 The frame is constructed with aluminum tubes joined with ornate aluminum lugs and internal steel expanders. 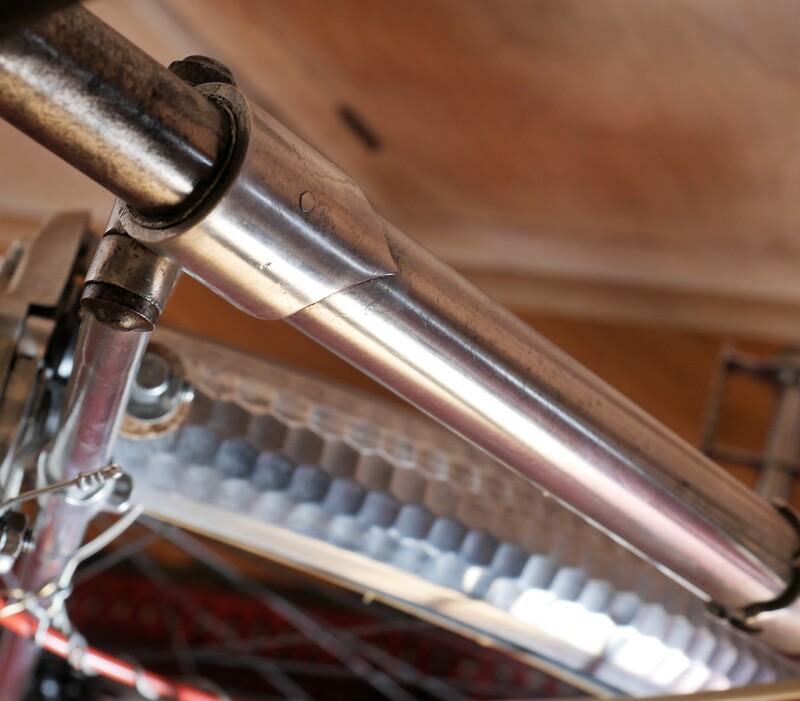 The front fork is good old steel, but the rest of the frame is 100% “duralumin” – the same stuff that blimps were made from. 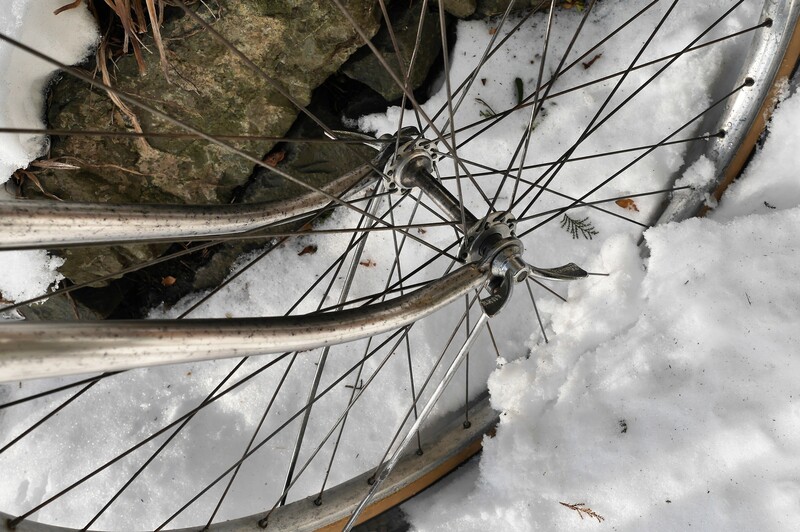 Once I finally had the rear wheel’s axle spacing and dishing issues resolved (the 650b Mavic rims/F.B hubs wheelset installed replace the incorrect 700c wheels on the bike when I acquired it), I could devote time to mounting the 650b tires and dealing with fender line issues. 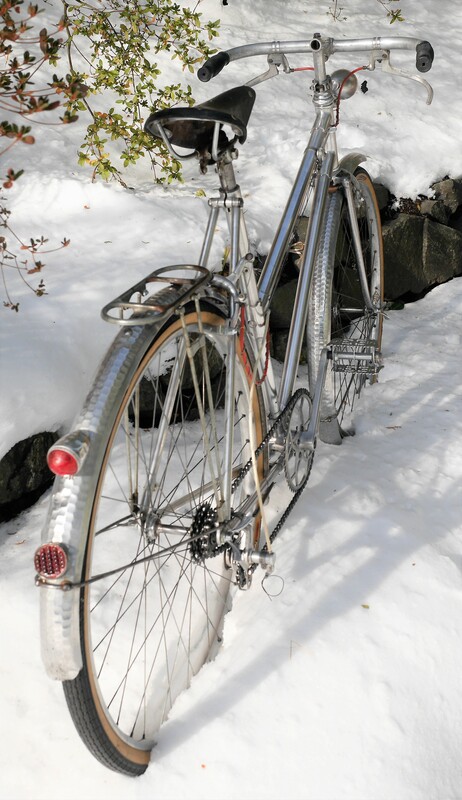 This bike’s beautiful hammered Le Martele Lefol fenders were meant for tires a bit larger than the Panaracer 40 mm Col de la Vie tires I mounted to the the vintage Mavic rims. That meant spacers. 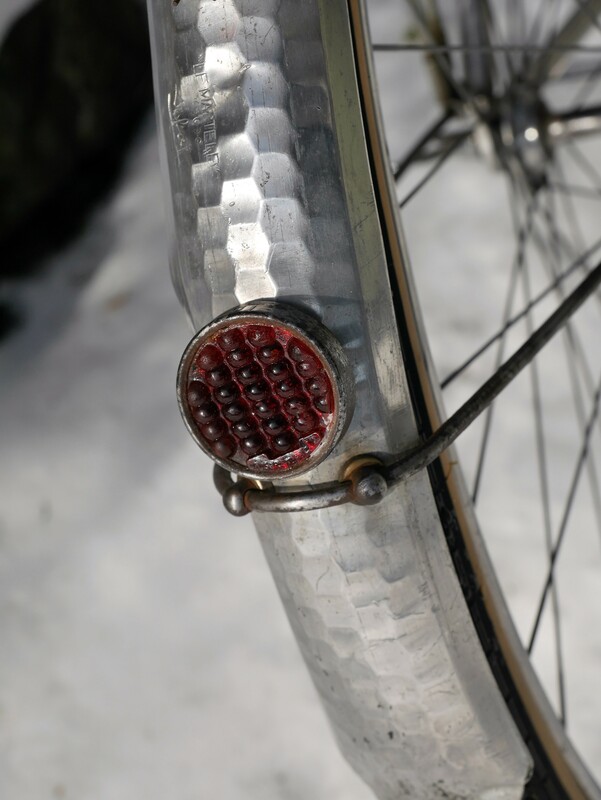 And, my favorite spacers are wine corks. 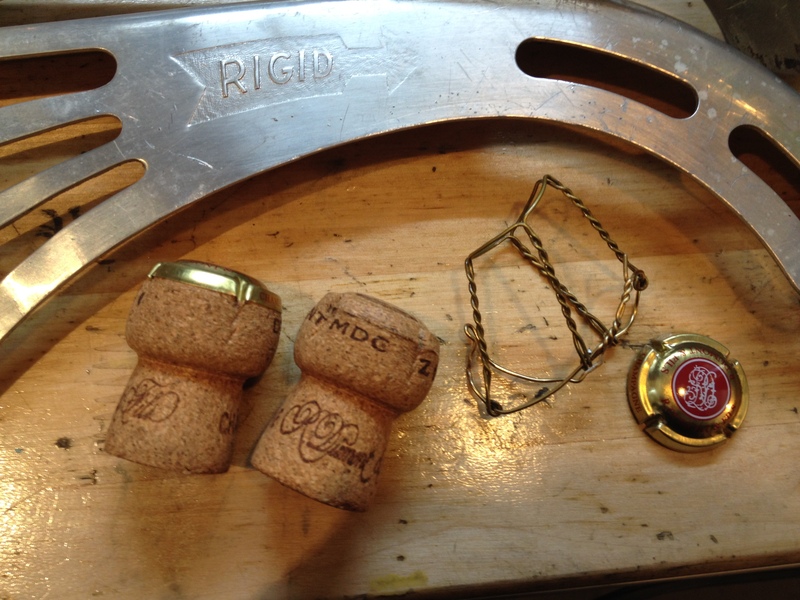 Therefore, it was necessary and advisable to open a couple bottles of champagne (the higher priced, the better), to obtain the corks needed to meet this objective. 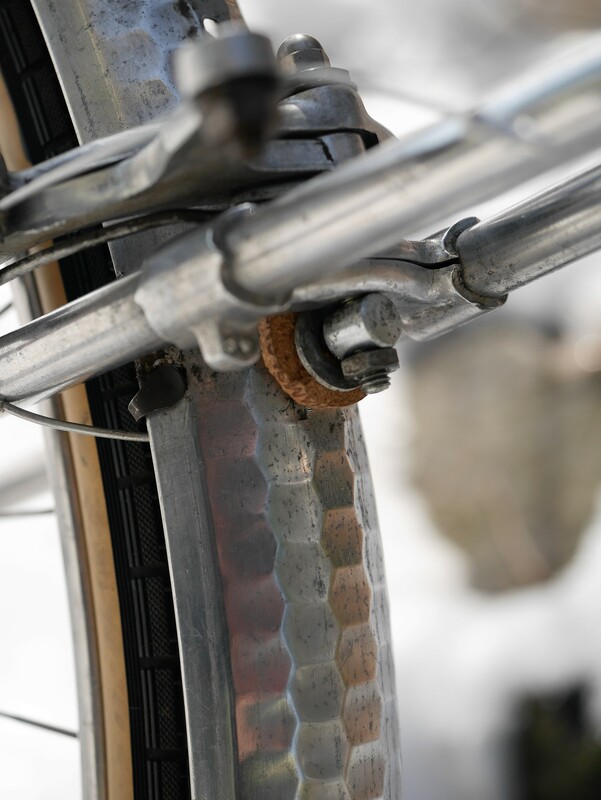 The photos above show the champagne corks installed on the front and rear fenders. 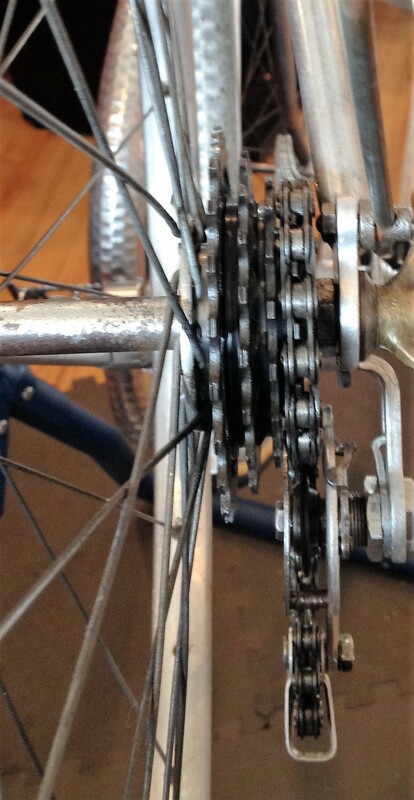 Another issue was the chain line adjustment. 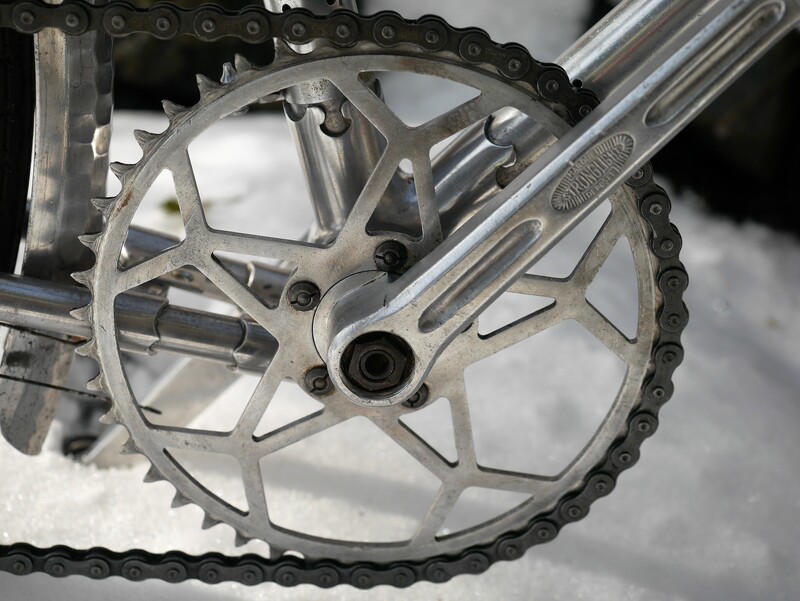 Once I had the rear derailleur installed – a NOS Simplex Grand Prix – it became clear that even after adjusting it to push the derailleur as far in toward the frame as possible, and after re-spacing and re-dishing the rear hub, the chain line was off. 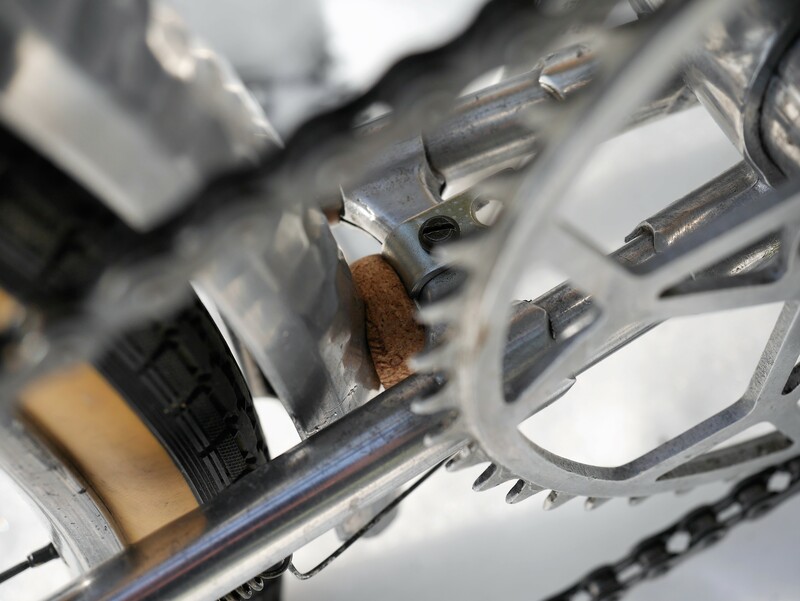 It was going to be necessary to push the crankset away from the frame, by a few millimeters. 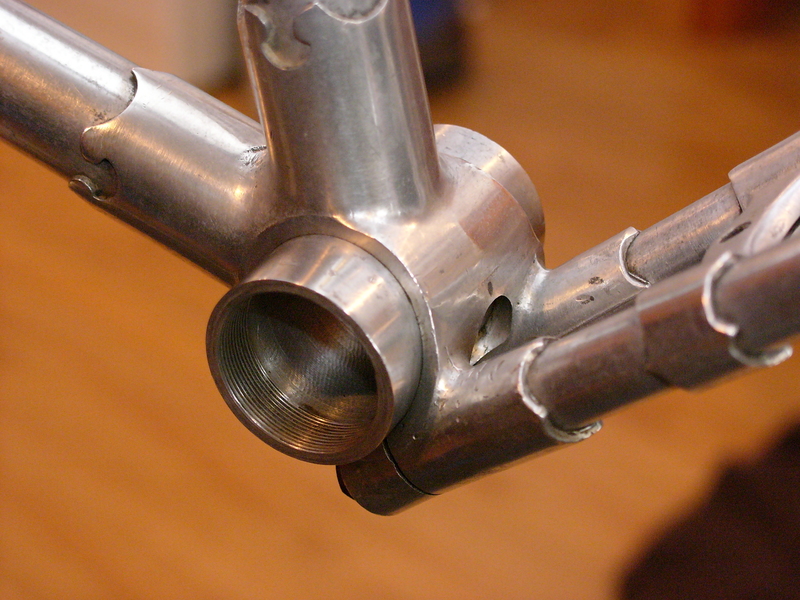 Fortunately, with this unique frame’s method of joining of the bottom bracket with brass bolts to the chain stays, I determined that I could remove the bolts, and then re-position the bottom bracket accordingly. 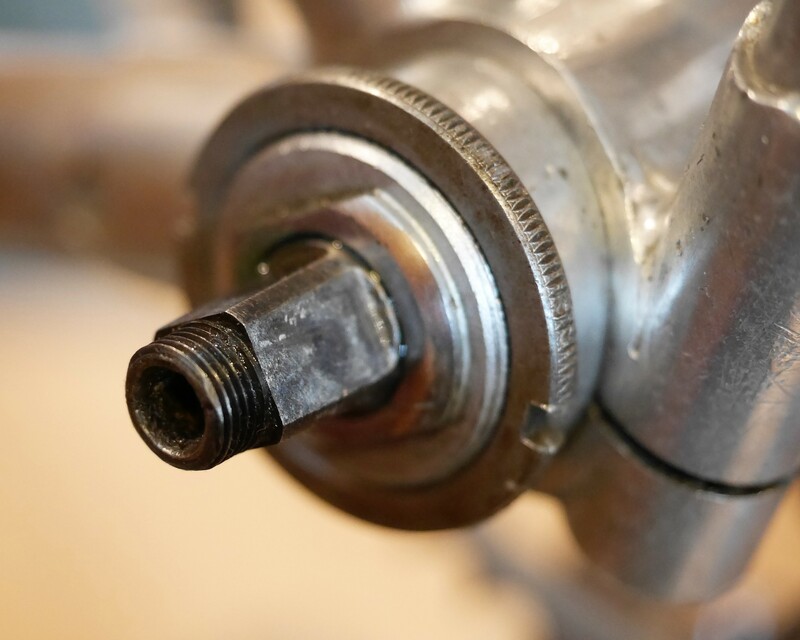 I removed the bolts from the frame, lubricated the bottom bracket shell – which is a beautifully machined aluminum cylinder, then began the process of moving it slightly over to the right. 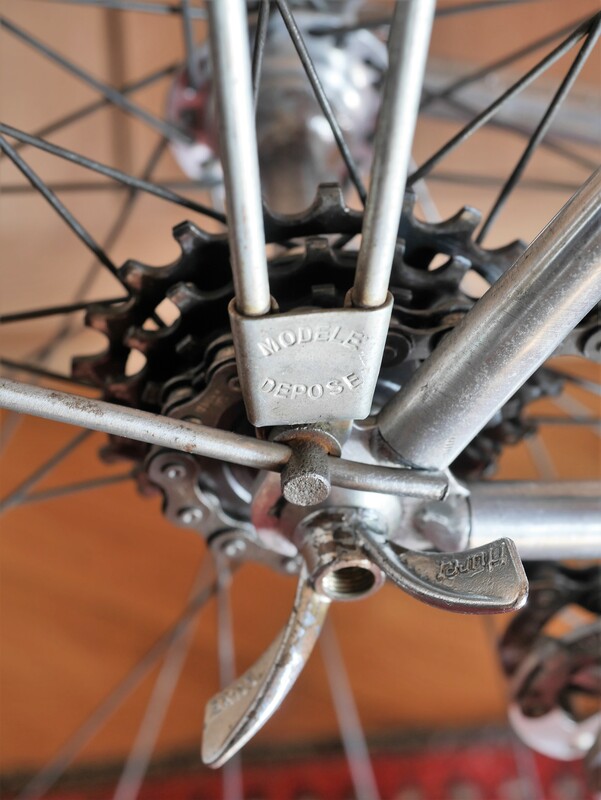 This took the work of a mallet as well as my Lozan BB lockring wrench, but finally I moved the BB cylinder enough to provide the chain-line I needed. 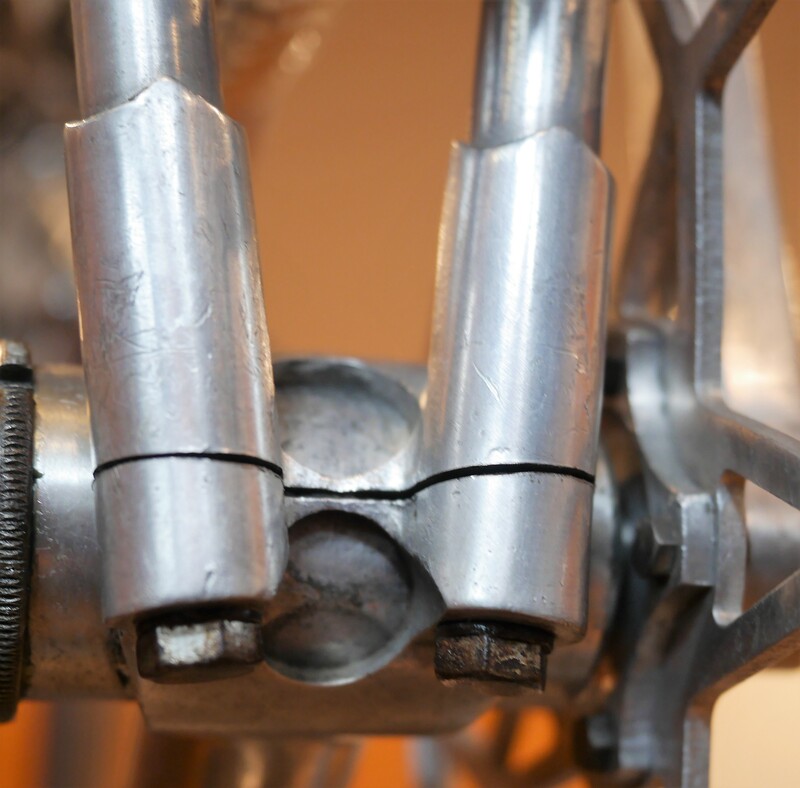 One of the many interesting things about this bike is that the BB axle is hollow (to save weight) and the crank bolt on the left side is threaded backwards. Something not to forget in the future! 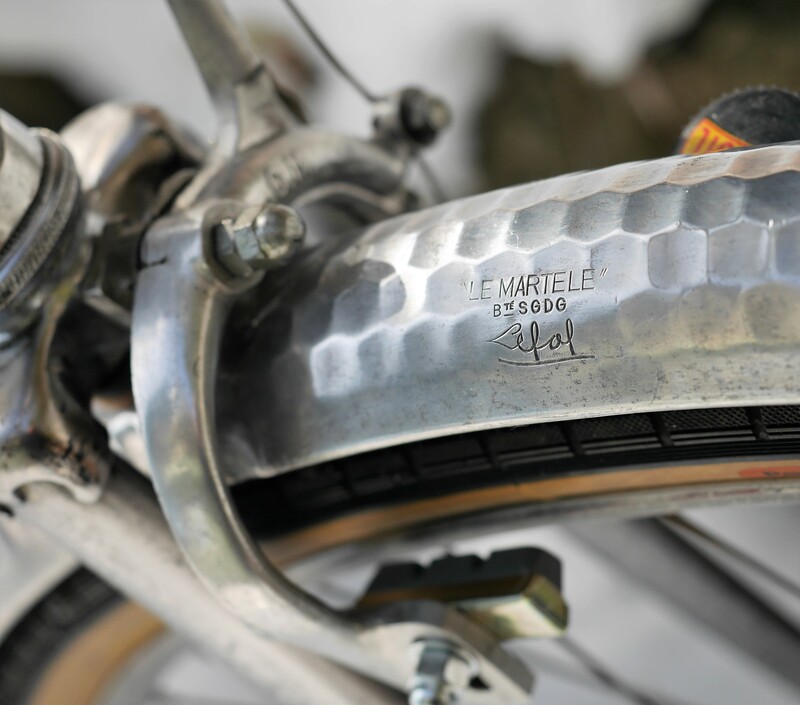 The bike’s leather saddle – an Ideale Model 80 – might be worth more than the bike itself if eBay seller pricing is to be believed. 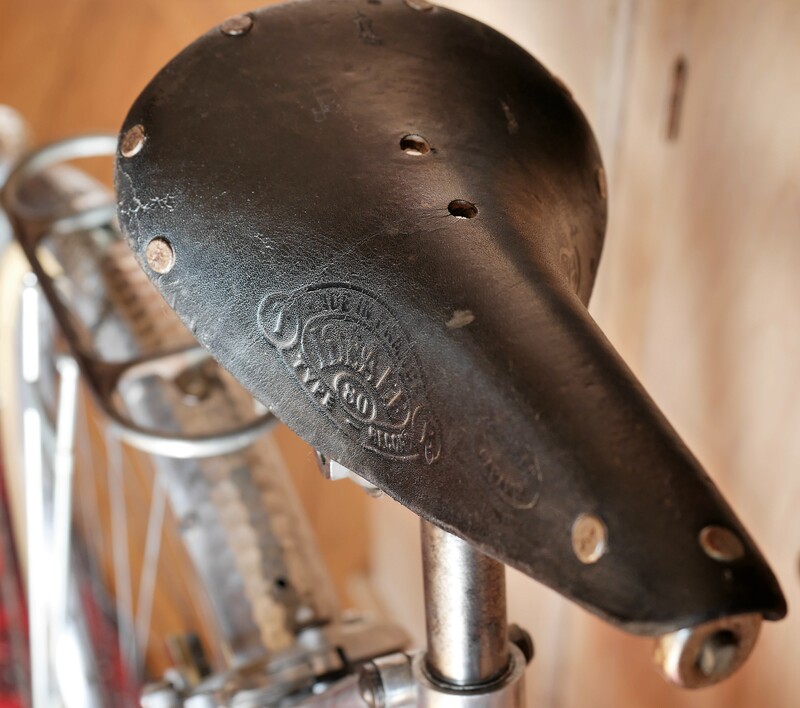 The saddle is a little dry, but after reconditioning it, I think it will prove to be very comfortable. 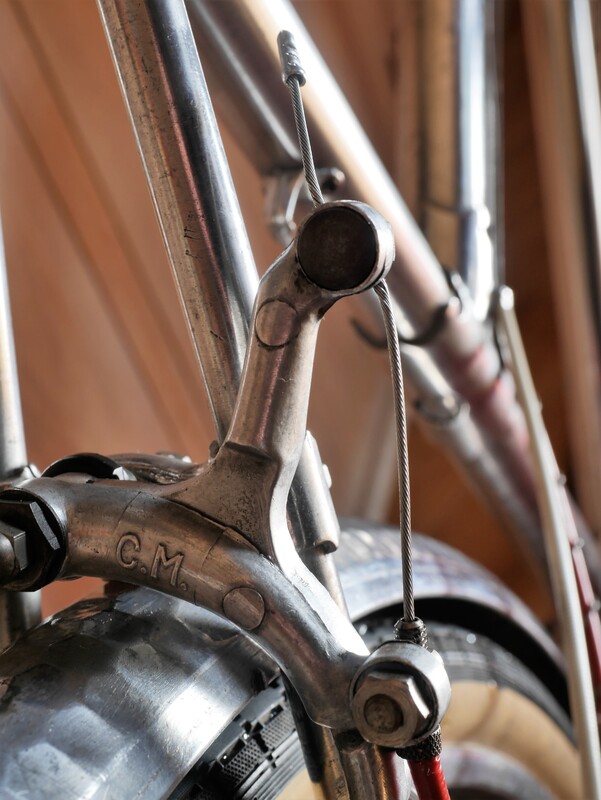 The “C.M.” brake calipers are a long reach mechanism from the 40’s that I used to replace the incorrect CLB 700 brakes that were on the bike when I purchased it. 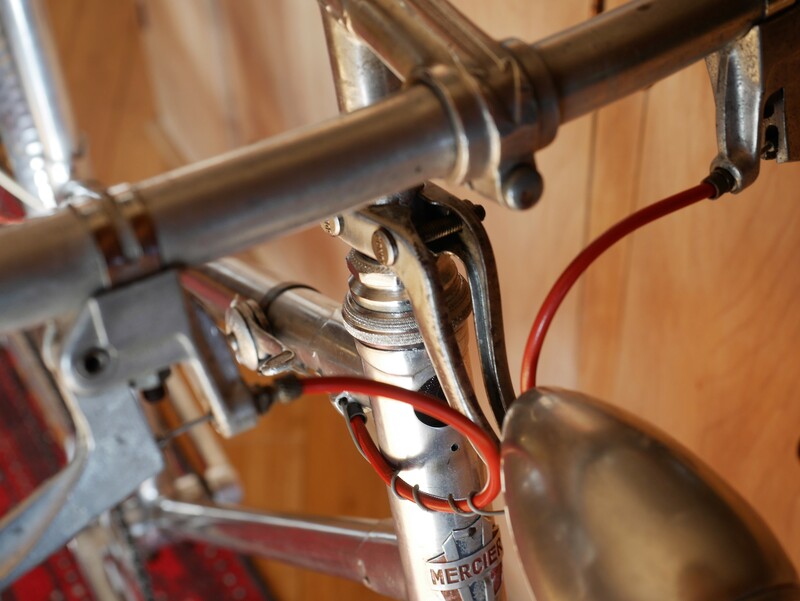 You’ll note from the photo above that I reversed the hardware on the rear brake to accommodate this bike’s brake routing – to allow the cable to enter from underneath the caliper. 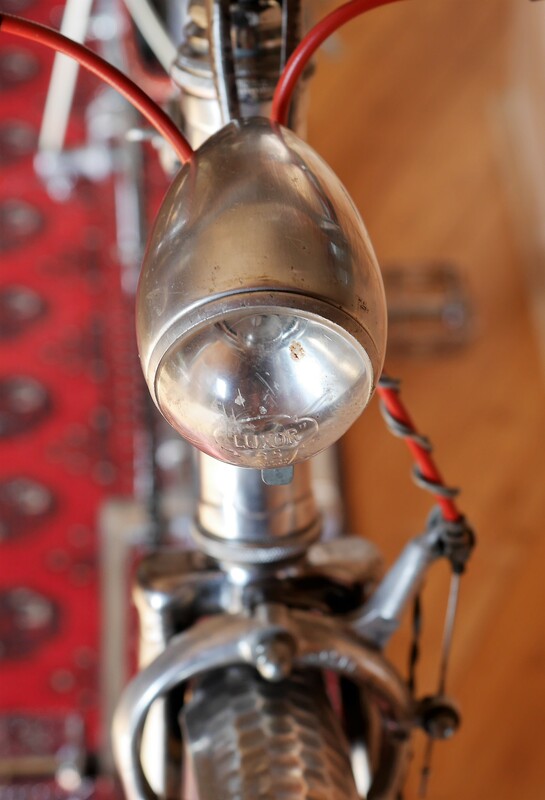 I also installed a French rear rack from this same era, as the original rack was missing. 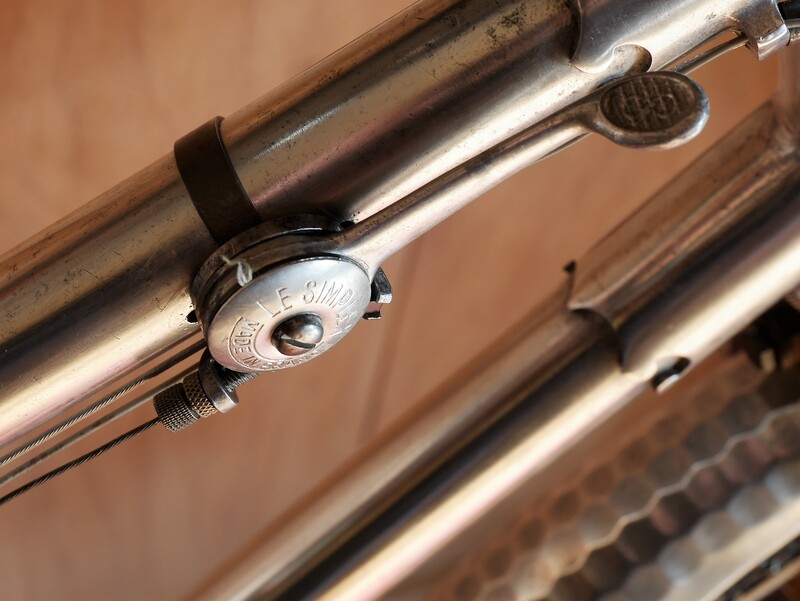 The above photo shows that the seat post lug is pinned, as compared to the rest of the lugs on this bike which are joined with internal steel expanders. 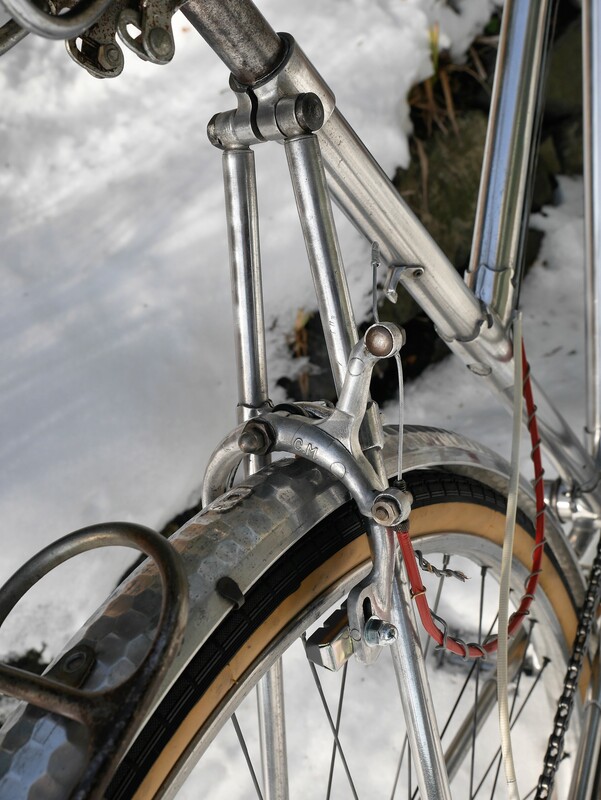 There were other methods of joining aluminum tubes back in the day when these bikes were built, but I think these Meca Dural examples are likely to survive the test of time. 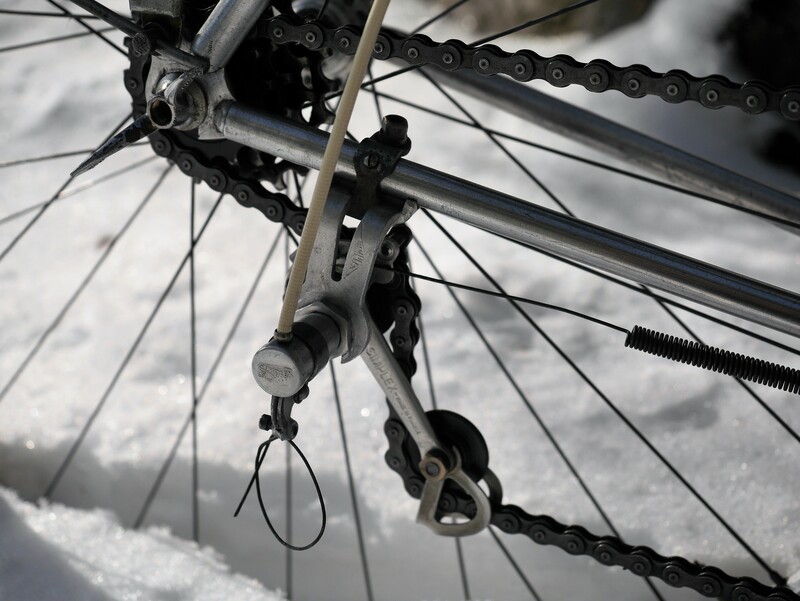 We’ll see once I get this bike out on the road. 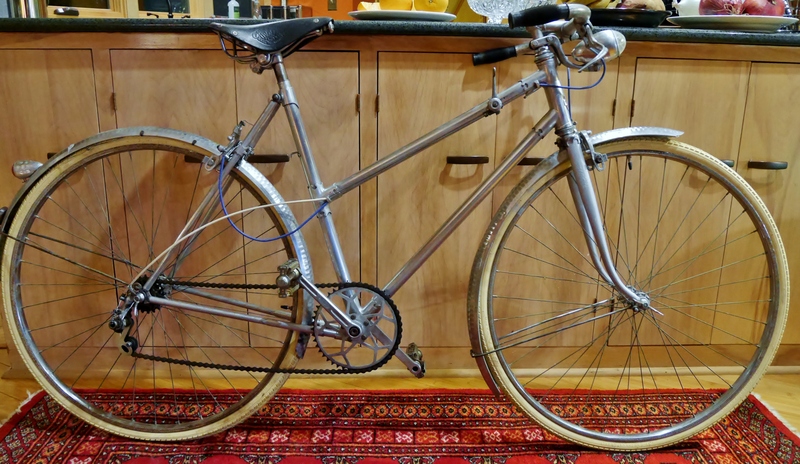 It’s funny (but not really) that the before and after photos of this bike don’t look that much different. 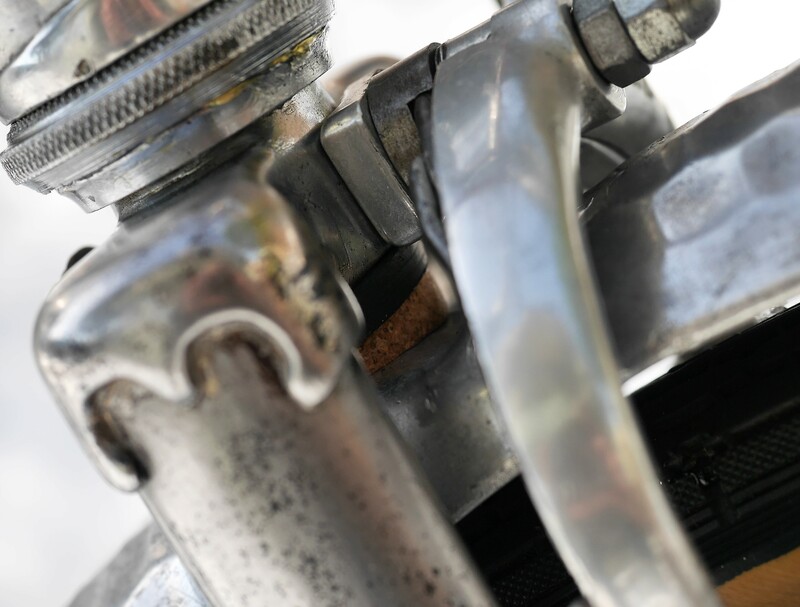 Perhaps what’s different is my perspective – the bike is now ready for a test ride, with appropriate components, and a period-correct restoration to make the bike 100% rideable. I threw my leg over the saddle today just to see how the bike felt and I was startled to find that this bike fits me perfectly. I can’t wait to get it out on the road. For that, the weather gods must provide. 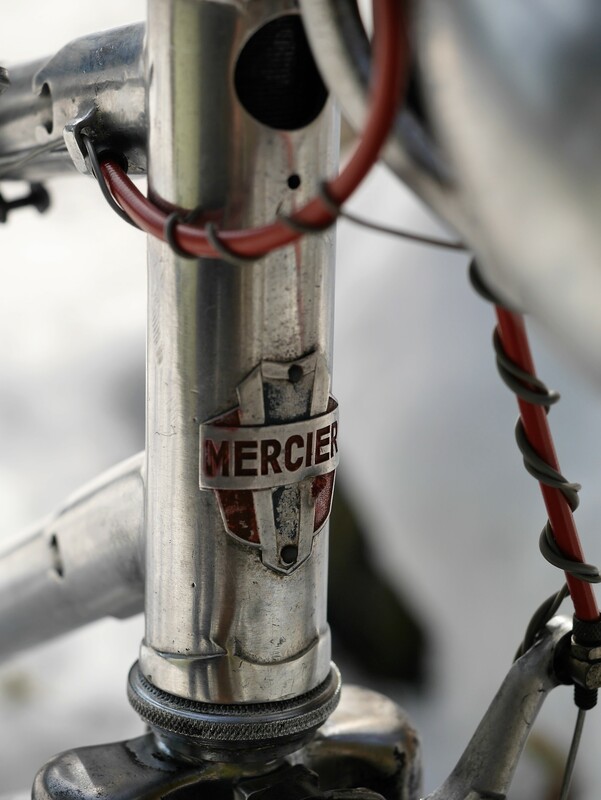 This entry was posted in 650B, Bicycle restoration, Ladies Vintage Bicycle, Mercier, Mixte bicycle, Vintage French Bicycle and tagged 650b, aluminum fenders, bicycle restoration, duralumin, French bicycle, hammered fenders, Ideale saddle, ladies bicycle, Luxor 65, mavic rims, Meca Dural, Mercier, Mixte, Simplex Grand Prix, vintage french bicycle by Nola Wilken. Bookmark the permalink. Wow. The perfect combination of complexity and simplicity. What an interesting bike! You went through quite a bit to get this done, Nola, and we are proud of you. A classic C&V build for the ages. Thanks, Paul. It was quite the undertaking! Yes, Don. 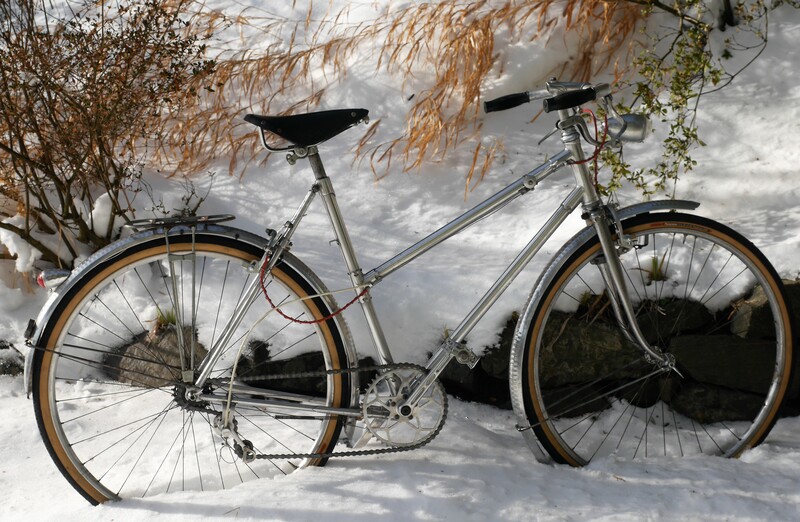 The Jack Taylor Tourist is a real beauty and a fun bike to ride as well. Hey Nola, how does it ride? 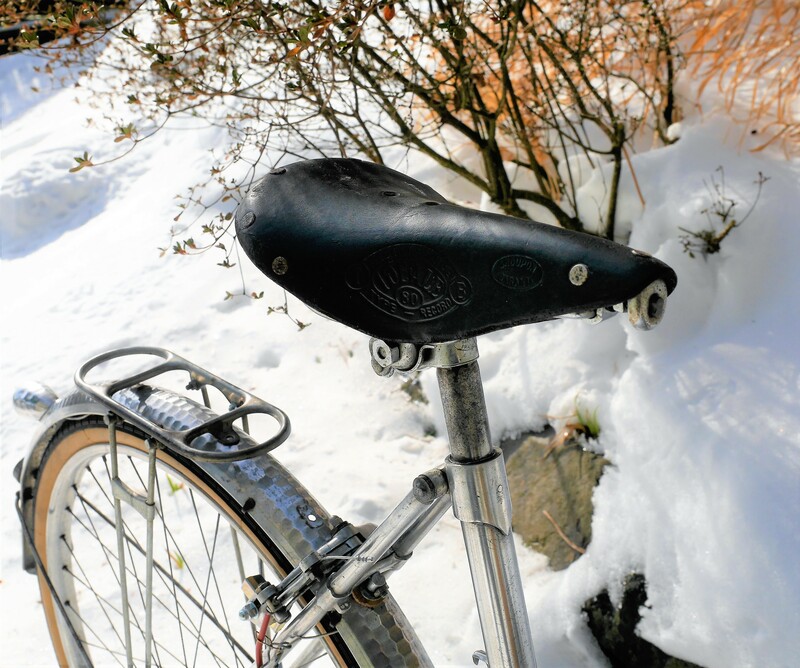 I will post an update once I’ve given the bike a test ride – waiting for my schedule, and the weather, to clear.